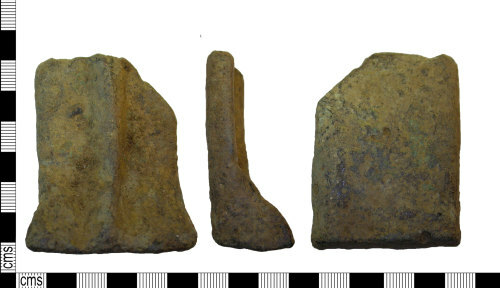 Late medieval copper alloy pot leg, 60mm in length, 45mm wide and 13mm thick with a weight of 170grams. The object is rectangular in form and sub rectangular in cross section. One one face the the foot is decorated with a central triangular cross sectioned ridge running vertically towards its lower edge which extends forwards to form a splayed triangular cross sectioned foot. Dating to the period AD 1300-1600.